Louder Than Life Festival Experiences Announced! 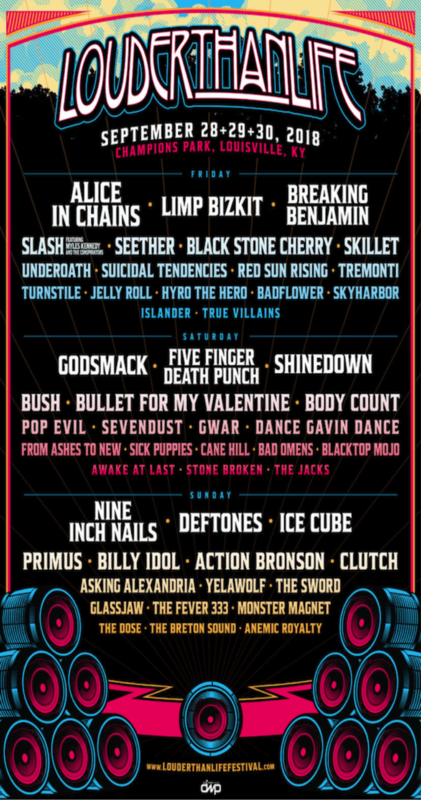 The lineup of festival experiences has been announced for the fifth annual Louder Than Life, which has expanded to three days in 2018, Friday, September 28, Saturday, September 29 & Sunday, September 30 at Champions Park in Louisville, KY. The World’s Largest Rock ‘N’ Roll Whiskey Festival features a wide range of music artists, including Nine Inch Nails, Alice In Chains, Godsmack, Deftones, Limp Bizkit, Ice Cube, Five Finger Death Punch, Breaking Benjamin, Shinedown and many more acts on three stages, along with award-winning bourbons, whiskey, spirits, craft beer, and the best food Louisville has to offer. Louder Than Life tickets, VIP packages, and hotel options are selling fast, but limited quantities still remain on sale at www.LouderThanLifeFestival.com. Attendees 21+ up can choose to visit Bourbon World presented by Louisville Courier Journal, and enjoy crafted cocktails at the exclusive Down The Rabbit Hole Speakeasy; sip fine wine at the Caduceus Wine Garden or enjoy a local brew at the Terrapin Beer Company Craft Beer Bar. Other spirits can be enjoyed at the Heavy Tiki Bar presented by Jim Beam, or at the Jack Daniel’s Experience for a “taste of Tennessee.” In addition, the exclusive Silver Dollar Hunter’s Club will offer with experimental, rare, and hard-to-find bourbons–a bourbon hound’s dream come true. Bourbon World presented by Louisville Courier Journal: With 95% of the world’s bourbon coming from Kentucky, festival producers Danny Wimmer Presents have hand-selected expressions from the top distilleries to create a unique opportunity to enjoy bourbons and exclusive one-time specialty cocktails inside what may be the World’s Loudest–and Largest–Bourbon Tent. Site-wide, an enormous selection of bourbons will be available. Participating bourbon brands include: 1792, Angel’s Envy, Barrell, Basil Hayden’s, Blanton’s, Bloody Butcher’s Creed, Booker’s, Boone County Distilling, Bowman Brothers, Buffalo Trace, Bulleit, Contradiction, Coopers’ Craft, E.H. Taylor, Eagle Rare, Elijah Craig, Elmer T. Lee, Evan Williams, Four Roses, Jefferson’s, Jim Beam, Jim Beam Black, Kentucky Owl, Knob Creek, Larceny, Maker’s Mark, Maker’s 46, Michter’s, New Riff, Old Forester, Peerless, Rabbit Hole, Rebel Yell, Rock Hill Farms, W.L. Weller, Wild Turkey and Woodford Reserve. Additional featured spirits include: Jack Daniel’s, Southern Comfort, Tito’s Handmade Vodka, Uncle Nearest Whiskey and Whistlepig. The Louder Than Life food and beverage options will be provided by Southern Hospitality Concessions LLC, DWP’s affiliate concessionaire. Festival attendees will be able to experience a taste of Louisville and beyond. In addition to Anthony Lamas’ restaurant Seviche catering the Top Shelf VIP areas, selections from the following local and national restaurants will be available: 502 Café, Blackbeard Espresso, Black Rock Grill, Cheese Louise Gourmet Grilled Cheese, Chicago’s Dog House, Citizen 7, Doc Crow’s Southern Smokehouse, Eli’s BBQ, Gelato Gilberto, Hull and Highwater, Island Noodles, Joella’s Hot Chicken, Longshot Lobsta, Master Of Patties, Merle’s Whiskey Kitchen, Midway Café, Mike’s Kentucky Kitchen, Mike’s Prime Rib, Pie Baby Woodfired Pizza, Ramiro’s Cantina, River Road BBQ, Sarino, Steel City Pops, The Coffee Shop Powered By Heine Brothers Coffee, Tumbleweed and Zoom Zoom Yum. Patrons looking for an elevated culinary experience are invited to experience these culinary food parties where guests can enjoy signature cocktails paired with gourmet plates: The Lock and Key Pizza Parlor presented by Larceny proudly serving Spicy Pie Pizza; The Southern Soul BBQ presented by Maker’s Mark smoking meats from Boss Hog BBQ; and The Sip & Grill presented by Southern Comfort featuring renowned Louisville chef Edward Lee of Whiskey Dry who will be offering a selection of his gourmet Whiskey Dry burgers paired with refreshing Southern Comfort cocktails. Monster Energy Experience, fueling the festival with energy. f.y.e Fan Experience, the only place for your favorite bands’ music. The Music Experience, an interactive exhibit featuring guitars, basses, amps, drums and more. The Student Experience, offering a unique opportunity for youth engaged in music and art related academic programs with unprecedented access and an inspirational behind-the-scenes look at the festival. Jack Daniel’s Experience, a mobile museum that brings a little of the much-loved distillery from Lynchburg to Louisville. Plus, Whiskey Row Cigar Lounge powered by Diesel Cigar, Fxck Cancer/Dyin 2 Live, Take Me Home, and It’s Miller Time VIP. Louder Than Life is produced by Los Angeles-based Danny Wimmer Presents, a producer of some of the biggest rock festivals in America, including Rock On The Range, Bourbon & Beyond, Monster Energy Welcome To Rockville, Monster Energy Aftershock, Monster Energy Carolina Rebellion, Chicago Open Air, Monster Energy Rock Allegiance, Northern Invasion and more. Louder Than Life 2018 partners and sponsors include: Monster Energy, f.y.e., The Music Experience, Miller-Coors, Jack Daniel’s, Tito’s Handmade Vodka, Robert Mondavi Private Select, Zippo, Blackcraft Cult, Terrapin Beer Co., Diesel Cigars, Kentucky Lottery, Roadrunner Records, Fxck Cancer, Take Me Home, The Louisville Water Company and more. We believe in quality before quantity. Please drink responsibly. MONSTER ENERGY HOUSTON OPEN AIR Festival On Sale Now! Get Your Tickets While Supplies Last! Brutal Assault 21 – More Bands Confirmed! LOUDER THAN LIFE 2018 Full Lineup Announced!